How long will it take for people to understand the real problem. Stupid people! Stupid people who turn peaceful dogs into killers for sport, who continue to build up the myth of the dangerous breed, who make idiotic laws to appease a vocal minority who have no idea what they're talking about. This is a prime example of what's wrong with America. What's the point of a democracy if the majority doesn't rule? I agree, the majority doesn't rule - the media does. very true. The three branches and checks an balances don't work any more because big bussiness and the media are now unoficial parts of the government. However to be clear there's no other country I'd rather live in than America. Commenting to show that I hate BSL but will not comment further since talking about it pisses me off and I tend to take my anger out on Errik lol. Lol. Yeah no need to get mad at Errik for no reason. Can you imagine what would happen if they outlawed all the new little designer breed dogs?? Would people start to care more? OMG My Shitpoo isn't allowed to be in my purse because he's an ill-behaved little yippy monster?? But.. but... he's my 'designer' dog! If someone gets bit/attacked by a mutt, the medias default breed is a pitbull. We read an article and saw the dog of an attack, and that dog looked nothing like a pit, it looked more like a shepherd mix. We asked why the newspaper reported it as a pitbull, and they responded by say that they didn't know what breed it was so they chose to call it a pitbull. If you say a poodle bit someone, the response is more like "we that person must have been mean to the dog"; If you say a pit bit someone, the response is more like "god, those dogs are evil"
Don't blame the dog, blame the idiot. What really pisses me off is when "dog people" over-generalize. When we are at the dog run, there have been plenty of times when a pitt owner will come in with his/her dog and when the cute little pittie goes to greet the other dogs, I see some owners run over to get their dog away. I've also heard comments more or less saying that people with those "dangerous" dogs, should not be allowed to come into the park. GRRR!!!! Those people need to meet Jessica's Ruby...that little peanut pibble will change anyones mind! I wonder when owners will realise that by freaking out over a calm pitt bull to protect their small, yippy, annoying dog (or normal, nice dog) will just cause more trouble. Huh. What always gets me is when someone makes a comment about a breed being dangerous or aggressive, only to find out they have never even met one of the members of the breed they are referring to... in some case they couldn't even tell you what a looks like! We had that conversation at training class of all places, meanwhile the person's (lab mix) dog is barking and lunging at every person that walks in the door... Blue, he's just sitting waiting for me to give him treats, like a good boy. It just feels a lot like racism, doesn't it? So sad. Our Shiba Friend Hunter was totally discrimnated against the other day. Andrea (Hunter's Mom) went to sign him up for Doggie Daycare and filled out all the paperwork. Well the girl at the desk said the woman who does evaluations wasn't there and she would call her to set something up. The next day the evaluator called her and said they can't accept Hunter because he is a Shiba Inu and they are dog agressive and don't play well. She NEVER even met Hunter! It is indeed a lot like racism, by its very essence believing that breed has everything to do with traits, tendencies, temperament, capabilities.. It is breed discrimination. I've been bitten by a shiba, a lab mix and a beagle. I've interacted with tons of bully breeds/mixes and never once had to fear for a limb or my life! Beyond BSL, which is incredibly controlling on a free will to own and care for individual dogs, is the stigma that the media places on the breed, how wording and research can save a life. Bad Rap rescue is such a beautiful beam of light for bully breeds - they speak truth to power, I just wish more of the media would listen. Nathan Winograd had a very good article about a recent dog fighting raid in MO, he is a major player in the No-Kill movement and fair assessment for all shelter dogs. Anti-BSL and the no kill movement have a ways to go, but I think with support in the right places, lives will indeed be saved. In all honesty, the wording should probably read "Dog owners who are lazy and lack sufficient intellect to raise and train their dogs will either be charged an exorbitant fee or lose coverage." Instead of the excess fees or loss of coverage to the good owners who have amazing dogs that apparently "are more prone to biting than others..." It irritates me. I've been bitten by a fluffy little white dog and a yorkie. Pretty much every pit mix or other "dangerous" breed has mauled me with kisses. Kristen- That's total BS, with Hunter. I think we're going to need to form a Nihonken.org militia to defend the rights of dogs. Call us before you go, I'll put on sunglasses and pretend to be yakuza. I've found that waving a katana around and screaming in a fake accent is the only way to get results with some people. If the stigma of the "fighting dog" can be combated with the rehabilitation and subsequent positive, thorough media coverage of the achievements of a former fighting pit bull terrier/staffordshire terrier/etc., then maybe BSL will have no place in modern society. Maybe. "The Dutch government says it will lift a long-standing ban on pit bulls because it did not lead to any decrease in bite incidents." "Instead, the country will focus on enforcing local leashing laws and owner education programs." ---> Why can't we have that instead of increasing "dangerous breeds" bans.... ? awwwwwesome. The Dutch got it right. Announcing a new Meetup for The New York Siberian Husky Meetup Group! Please meet at the north side of Washington Square Park, at 5th Avenue and Waverly Pl, next to the large white arch. Bring flyers, bring signs, and bring candles for the vigil. But above all else, bring yourselves! We are going to protesting BSL (breed specific legislation) Some thing that is very important to me and many other pitbull and even non pitbull owners. THis is a day where we can stand up and fight trying to out law our faithful friends and try to ward off bad stereotypes! The KC Dog Blog is one that has taught me a lot about how to view BSL and "aggressive dog" and other animal welfare issues from a balanced, thoughtful perspective. I highly recommend it. I'll add more as I find them. And I see that M.C. has added KCdog blog, too, which is also linked to Crosby's blog. here's an interesting article on BSL from a legal stand point. It notes, too, that the CDC is NOT in favor of BSL since they do not believe that dog bites are tied to a particular breed. DVD That's into the BSL Beyond the myth movie. Friend had it on their wall. LoL @Saya, I was going to post that movie here too. Beyond the Myth was a really well made documentary talking about normal, responsible people suffering because knee-jerk laws. One of the towns talked about is actually located in a state that has a law against making BSL laws, but the town manged to find a loophole to get it passed. The people interviewed are people with families, some with young children that didn't understand why their best friend was being ripped from their hands and slaughtered. Little old ladies had to hand in mug shots of their dogs to the police department and be labelled as "vicious dog harbor-ers", even though their dogs haven't done a thing to be considered vicious. Many of the dogs weren't even pitbulls, some were boxer/lab mixes. And then there was mention of other towns, such as one in Michigan, placing bans on other breeds. And you know what, even if every single bully breed suddenly disappeared, then they'll just go after another breed to label as evil and vicious. Edit to add that this documentary is currently available on Netflix, so go and watch it. @KitsuneArcher After reading the other thread concerning this, I am officially rankled. As an owner of a type of dog targeted by BSL, I don't get the logic. Goldens bite more people a year than pitbulls, and I've seen my fair share of stories involving children being killed by Labs (sometimes mistakenly labeled as pits, because apparently all black dogs with round heads are pits), yet they are never targets. As far as the whole, shibas not being capable of hurting someone, I think thats just screaming ignorance of the breed. The main reason shibas have to be so intensively socialized is because they can have human aggression. Shibas have been known to bite people. Why do you think a lot of breeders are leery about adopting to homes with children? Because shibas will lick them to death? Heck one year a Pomeranian managed to kill someone. All dogs have teeth, and all dogs can do a lot of damage to a person. It is also worth noting, a lot of "random" dog attacks are not random. When it comes to children, especially, there seems to be this culture where parents allow their children to negatively interact with animals. I once had children, try to beat Kenshin with sticks when he was a puppy. I took the hits for him, and from that moment on, he has hated children. I have watched people allow their children to torture their dogs, by pinching, twisting their ears, and tails, stomping on them, and then when the dog reacts, its labeled as random. Then you have people who beat and lock their animals up because it did something like drool over food. When I got zora, many dog "experts" recommended that I tie her to a radiator. A RADAITOR. When I told them no, their response, was how was I going to control such a big dog? Easy, I trained her. If I could do it at 12, why the heck can't so many people train rottweilers? I'll tell you why. They are lazy. When surveyed most Americans walk their dog an average of 15 minutes a week. Yea, you read that correctly. So if thats all they walk their dogs, how much time do you think they will put into training? Not mention, dogs like pits are high energy. You keep a dog like that, on a crappy schedule, on a crappy diet, with no stimulation, and is constantly tortured, what do you think is going to happen? Lets not forget that these dogs are so cheap and common, breeding has no direction. Infact 90% of pits I see are mixes, usually with labs to make them "bigger", which is stupid since labs are mouthy, now add in that pitbull jaw power, and that labs drive with the pits drive, and you get maulings. A pitbull properly bred to fight other dogs, actually will never bite humans. They had to breed dogs that could be pulled apart without risk to their handlers. Why do you think all of the Vic dogs were so sweet, and all but one was adoptable. The gross ignorance concerning bullies, and other breeds that are targets due their size and "scary" looks is beyond me. If people stopped looking at mainstream news outlets, which in all honestly glorify the horrendous, they would realize many of these breeds are also pretty accomplished in therapy work. Last note, ducking your head in the sand because one of incident which generated a phobia does a disservice to everyone. If you can look at the mass graves, where people had their dogs forcibly ripped from them, including puppies, all dead in a ditch, and say oh well, then that takes a special kind of coldness, that makes even discussing this with you in a calm matter near impossible. People get angry because they have to constantly defend themselves. Have to constantly be told by people their dog is a killer, or it shouldn't be allowed here, even though they have a dog just as sweet as your kit. Thats why you see that. And when you word things such a way, it makes people upset. I am passionate about all breeds. Even if I don't have a desire to own a breed, it doesn't matter because I love dogs. I will defend them, and the right to own them because thats what dog lovers do. We are passionate. My neighbor doesn't even walk their dogs for that much.. Poor dachsund is tied out in the yard just because it's a small dog doesn't mean it doesn't need walks! I don't see any posts by you here my guess it was on the Why poor little pits? or some other thread? I'm missing something. but ah well. I really hate it when people edit their posts. Don't posts if you don't want criticism. Here's a video which is sad..
Has info on it on the dog's stress signals and sadly parent's allow the kid to jump all over the dog even when the dog walked away from the kid. The rottweiler is very patient for what it had to go through. worse if the dog feels none of it's warnings are working eventually will need to give a correction nip coarse it'd be the dog's fault because it's a scary dog! F no it's because owners have no clue on dog's stress signals. "shibas not being capable of hurting someone"
That depends on the someone a shiba can seriously hurt a kid and even an adult if he/she wanted to. "Edited because honestly, what's the point? I'm going to go make soup." What do you mean honestly, what's the point? No one even replied to your post on there that I saw. I'm guessing you don't like boxers too? So would you be fine if BSL came to Indiana Bella gets mistaken as a pitbull and police takes her and euthanize her for doing absolutely nothing? People are so dumb they can't even ID correctly what is a pitbull. 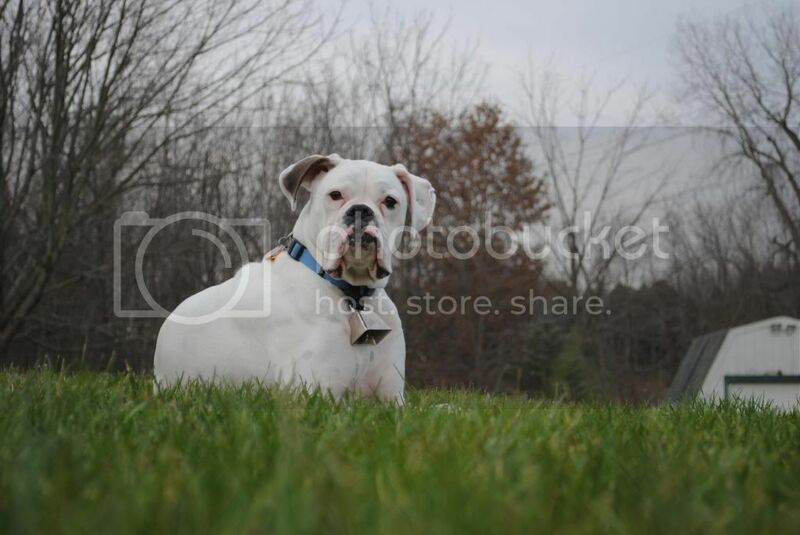 American bull dog fine they look more similar to a white colored boxer..
@Saya: The posts were in an intro. thread which is why I directed it over here, and bumped the threads on the BSL and bully breeds. And yes, some of the posts were edited, esp. the one in pit thread. There was a pretty offensive comment about kicking a dog, which is now gone. (And it's because people kept editing their posts later and totally skewing discussions that were underway that we have disabled the ability to edit posts after a certain time period. It's happened entirely too much on this forum.) There were some pretty outrageous statements made about bully breeds, but I did feel the conversation needed to happen in the appropriate thread, not in an intro. thread, as lately too many of the intro. threads have been going awry. That's why it's here now, and is a bit harder to follow. 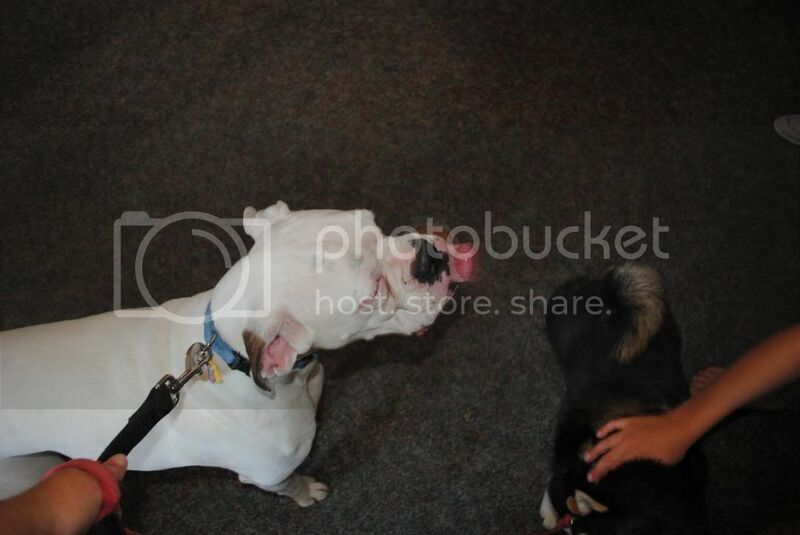 @Inoushi, yes, I was pretty rankled by the comments about bully breeds too. And I agree with your points! Speaking of the original comments, the reason I and others (Koji'smom, I believe) starting talking about the Akitas when the OP brought up BSL was because it's not just "pit bulls" which are being banned--it is a long list of dogs, and Akitas are often included on that list. It was not an attempt to "stir the pot" as the writer suggests, but rather pointing out where BSL leads: its more than just pit bulls that are being targeted and have been targeted in the past. I was particularly bothered by comparing pit bulls to guns and suggesting they should be licensed and then making a comparison to the shooting at Sandy Hook. It's a faulty argument, on many levels, but beyond that is pretty offensive. Somehow none of this surprises me one bit. Given the temperaments involved. Saya, someone hijacked my intro thread to pick a fight and then a mod bumped these threads to keep it going. Immature, hostile, obnoxious behavior all around. I had no intention of engaging in conversation with anyone involved as it would be entirely pointless. It cracks me up that a breed enthusiast discussion board turned out to be dominated by some grade-A grinches, but so it goes. I've been sharing some of this with friends in another part of the nets and we are having some epic lulz over it. My only wish for Christmas at this point is to have every post I've made here deleted or edited to null. I'm embarrassed I was ever here. No one picked any fight. Why did you feel a need to mention anything negative about bully breeds? You feel shiba have such undeserved bad rap, but you think it's OK to give pitbulls such evil glares? Look at this video shows a lot of dog's body language and owners are coarse clueless. Often times a dog attack has happened for a reason mostly due to abuse, ignored signals to back off and so on. You push a dog hard enough any dog will bite. 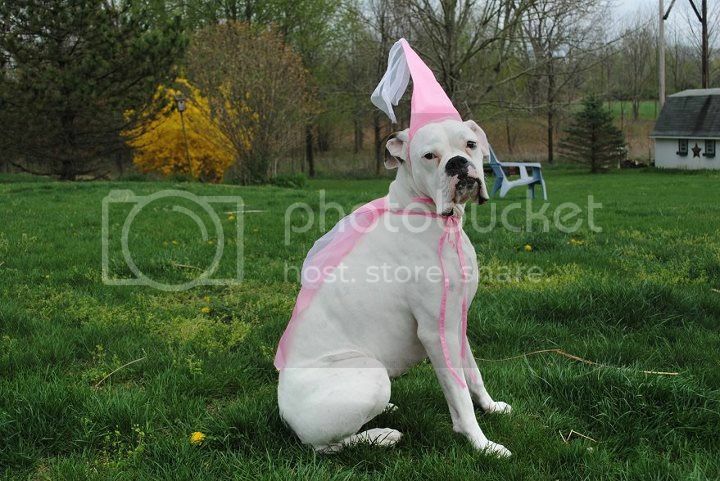 I own a boxer do you think I enjoy seeing your comments! It pisses me off when people act like Bella is some vicious wolf or tiger. 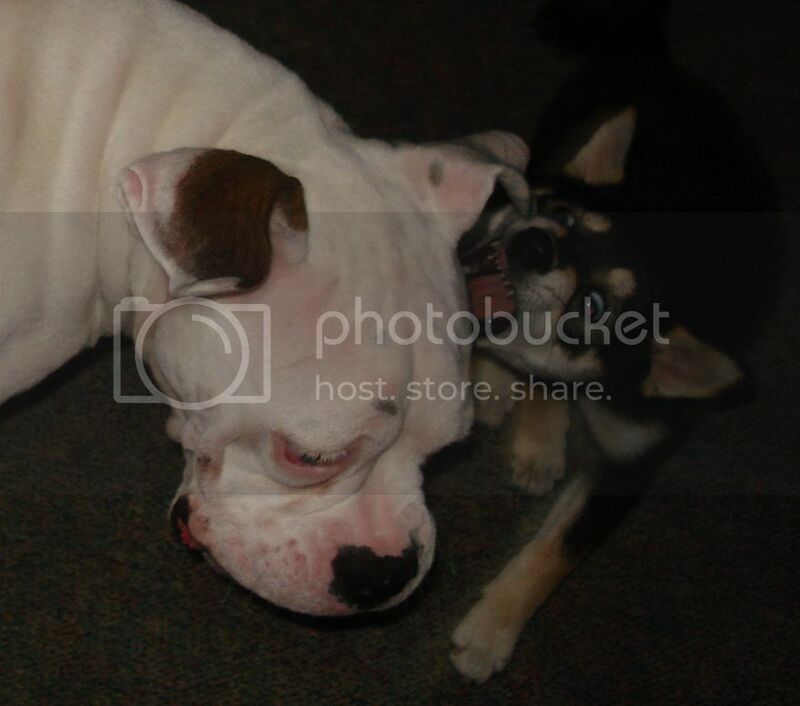 Which dog looks most vicious.. Shiba inu play much more scarier then how Bella plays. Watch out bordeaux ! Bella iz going to eat joo! So you want me to put an Ecollar on Bella and shock her for no reason? Or choke or prong collar? Uh no thank you! Bella walks loose leash on her collar and if we are walking at night or late evening when bunnies are out she is walked on her frontclip no pull harness. She will never have a prong, choke, or e collar on her for any reason. 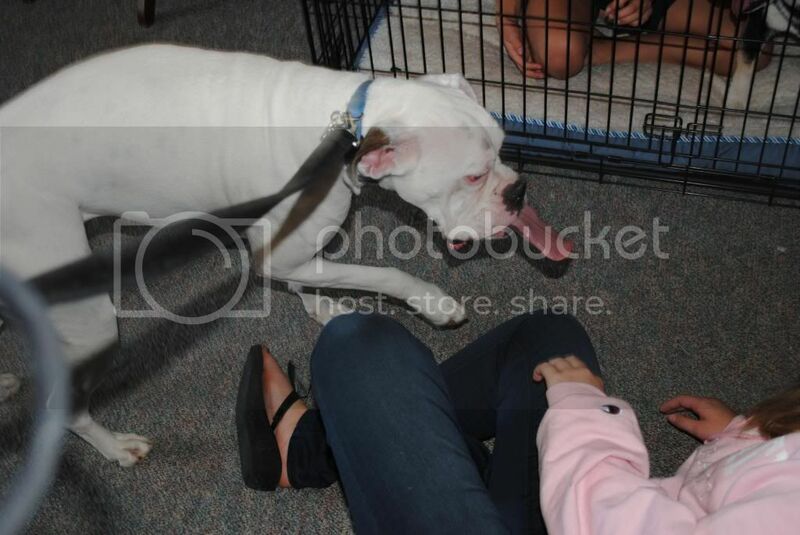 She behaves just find with people of all ages and kids. She loved my 80 year old Grandpa he stayed with me for 6months due to being ill and not taking his medicine typical stubborn man..
Bella was always calm with him he was weak as can be barely could walk without falling. She loves kids especially she licks them. Bella giving Maria a good licking. :) my cousins loves dogs and they love coming to my house as they can't have ones due to parent's too busy or have enough kids at the moment.. one more kid be too much which is what a dog is like. Bella is off leash around my gandpa he's asleep notice Bella isn't hurting him she only comes to him when he whistles at her and waves his warm to pet her. She loves being petted by him and licking his hand. My Grandfather is your type hated pitbulls and thought most dogs were vicious even sweet Saya coarse Bella isn't sweet only shiba can be sweet since they're a spitz breed not a bully breed.. He always asked if the dogs would bite him.. Um no! We would never gotten a dog if they had propensity to bite. Coarse Saya or Bella could bite, but they don't because they are well socialized and love people of all ages. Bella never done anything to deserve so much hate. 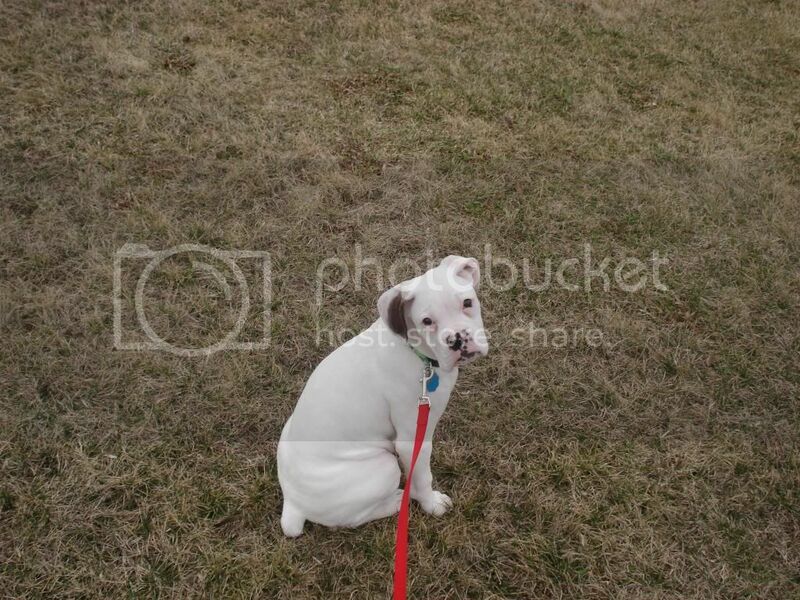 A another white boxer was shot because a police thought it was a pit bull. She got out of the yard and poor owner was looking all over and later found out she was killed. She wasn't hurting anyone either just enjoying a fun walk alone in the area. For someone who defends cesar you are not to well informed about him.. While I'm not fond of his training methods what he has said I like. "Blame the "Deed" not the "Breed". You don't need control collars to get a dog to do something. Positive reinforcement is best way to go. Our past boxers were not trained they pulled on walks dad tried everything choke collars did nothing, but choke the dogs how does that teach the dog to not pull. Bella I took the reigns and took control of training I watched a lot of Victoria stilwell and her training is much better barking mad was another show I watched before it's me or the dog and it had same basic types of training. Bella is our first boxer to learn to walk loosely on a leash and even does it when there is recent scent of deer or rabbit! both are very exciting things for any breed of dog! Our past boxers did well off leash though so it was funny. Luckily we have 16acres for them to enjoy and they listened well and came when called, sit and all that. Many here own or have owned bully breeds or other breeds on BSL list. Maybe more on the Nihon ken side, but some here too. A chow chow attacked Pearly do I hate all chow chows? No! They're cute dogs coarse not my type of dog to own, but I don't hate the breed. Pearly defended herself and she was unharmed. I had a issue with a shiba breeder on my FB page she wrote Kill him! on a picture of a garter snake. Really? How immature can you be!? I clearly wrote garter snake I think most people would know garter snakes are very harmless a dog would kill one then one kill a dog.. Her reason for such hatred of snakes? One of her puppies were killed by one. She found a snake by the puppy. Um why would you leave defenseless puppies alone outside! one anything could have killed the puppy if not a snake a hawk or owl. Heck anything could happen. Puppies shouldn't be alone at such a young age. That situation reminds me of how people hate bully breeds they seen one bad experience or read it all the time and they blindly hate all pit bulls. Media over hypes it. You won't get so many views reporting about a chihuahua hurting, attacking or killing a kid. Not just big dogs you need to worry about small dogs are dangerous too! Even in my state too IN..
A dachshund this time lets ban chihuahua and dachshunds! I love chihuahua and dachshunds while not a breed for me I don't hate them. I moved this simply to keep it out of the intro. thread. Some people disagreed with some of the gross generalizations about bully breeds and took issue with them. I'm always puzzled when people post something controversial or outrageous, then take issue with any type of disagreement, but it's not the first time, and probably won't be the last that people take things entirely too personally. @KitsuneArcher Why did you feel a need to mention anything negative about bully breeds? Also it is your introduction thread that you caused issue not spam thread. Though yeah on your spam thread there are some issues with you and me apparently? Whatever water under the bridge. Why is it that new people gotta cause trouble in intro threads? It's to introduce yourself not to write about dog attacks. Since you asked here's this shiba attack.. Here's a link to a shiba who attacked an Adult women and was shot for it. "Her injuries are extensive and will require more surgery," she said. The dog that was killed was a Shiba Inu and around 7 years old." This is a odd one.. Shiba bites off toe? Guy is a diabetic.. My grandfather is too and I know about the whole numb toe things.. He's had some toes amputated due to his diabetes and lack of care. He is never one to exercise or eat a good diet.. His idea of meal is eating just nutella, coffee, ice cream, windys, KFC, and candy.. When he stayed with us for 6months he acted like a 2year old and acted so pissed because he had to eat veggies or three meals a day. Over time he got better and actually came to like his omalettes for breakfast, sandwhiches or soup, carrots, green beans and hamburgers and so on. Though he did always complain he ate too much. Funny he got so much energy and strength after being fed a good diet. About when he was 6months in his stay he was well enough he could change clothes with no help, but he was going on and on everytime a lab or pit hurt someone going on how Saya is going to bite him! Or Bella mostly Saya my Shiba! Because Saya plays pretty scary and she is loud during play. Look at the play thread many examples how shiba plays with each other. Bella is much more silent and gentle in play with Saya. It sounds like an infestation of fear within people who hate certain breeds, which then leads to irrationality and pointing at "but the statistics say otherwise!" It's fine and dandy to not have a preference for a breed (I certainly don't want a brachycephalic dog), but to compare a certain ones to gun laws is absurd. Absolutely absurd. While bully breeds do have a chilling and violent history, that doesn't mean you have to continue the streak of pointing the finger at the dog. My best friend owns a 2-year-old Amstaf (or pitbull...) named Link and he's the friendliest, loving, good-natured dog that you'd come across. He put a lot of time into training him, socializing him, exercising, and taking him everywhere within Chicago. Admittedly, he receives negative, unwanted attention almost on a daily basis because of people who have the irrational hatred of pitbulls. He does see mothers pull away their children the moment they see Link. He does see people immediately put the leash on in dog parks and leave when he enters one. He does see people with puppies who want to approach Link but they grab them and walk away. It's sad to see this unwarranted behavior all because he owns a dog who is evidently a danger to society. It's sad that there is breed discrimination. It truly is. Here's the thing... regardless of how any individual member behaved or responded, what happened here touches on the fact that this isn't "just" a forum for breed enthusiasts, but also a meeting site for dog lovers who have a hard time letting potentially dangerous information sit uncontested. This is absolutely not some hermetically sealed safe zone where Shibas exist without any other dogs in the world. A lot of us are here because we learned to love all dogs through our Shibas. And when it comes to the logic that leads up to BSL, such types of kneejerk, indefensible opinions DO have the potential to harm. I would much rather be part of a community that actively debates and corrects misconceptions than one that just smiles and nods in the face of gross prejudice and inflammatory comments. This isn't the only time this issue has come up before this thread was bumped, so I was glad to get a chance to add to the pool of resources. Your one of those dog park members curlytails!? I'm not well informed, but I try to keep an opened mind I've had bad experienced with pit mix, pit bulls and lab mix, but I've met some nice ones too so the breed isn't 100% bad. Most pit bulls I've met are friendly and want to be petted or play ball. These are not evil dogs, lol. 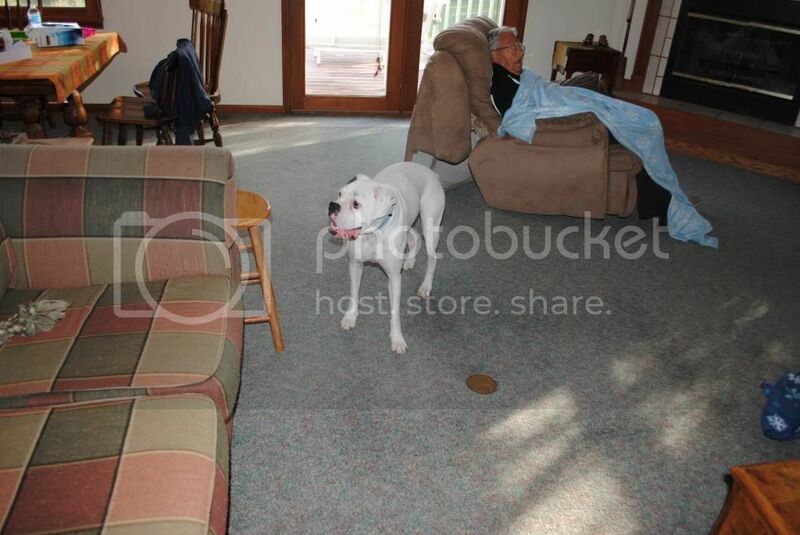 Grym is an example of a well socialized mastiff/bully breed. They are far more dangerous than Pit Bulls as far as strength and desire to defend against strangers. Their bite force is triple that of a Pit. CO have a high, high, high level of human aggression. Pits aren't like that at all. Even when they were heavily abused (by humans), they usually bounce right back and want to be around people, any people. You would never get that with breeds like CO. So why aren't CO on more breed ban lists? It is OBVIOUS that CO are stranger intolerant to a high degree from the get go, which limits what one can do with them. That would create all kinds of issues with "traditional" underground dog fighting techniques in the US. The Pitbulls fatal flaw is that it loves people, and so is easy to exploit in all kinds of settings. People are the bad guys here, not the dogs. They aren't loose canons either. A good CO uses good judgement, and when it is socialized well from the start, it can be a reliable safe dog in public. Grym is a canine blood donor and has earned his Canine Good Citizen, and has also defended the Chickens from coyotes and other predators like a good boy. People need to reconsider the labels they place on much "easier" dogs like Pitbulls, because any dog can bite. My worst dog bite in almost 2 decades of working with dogs professionally, was from a Shiba (it was not the dogs' fault)! BSL isn't the solution. Well this is an excellent example of why we deal with BSL. People with this attitude, unfortunately perputuate the problem. There is no use trying to reason with them. Even if they see a good dog, they will something along the lines of "they will turn on you one day" never mind the fact that the reason you have so many bites is because they are the most common. But you know what im not even go onto stats when they cite that particular site. I've seen that dogbite site since it first came up years ago, and it sickens me that its still around. As for the other comments, I feel really sorry for all of the people she is going to be responsible for enticing to get a shiba. Hopefully they will have the gumption to stick it out, but somehow, I doubt it. Inoushi, you're a card. Get over yourself. And you know what? If everyone who championed pit bulls ended up like Darla Napora... It would be kind of poetic justice. Tragic, sad, but somehow it also just seems like "Duh." 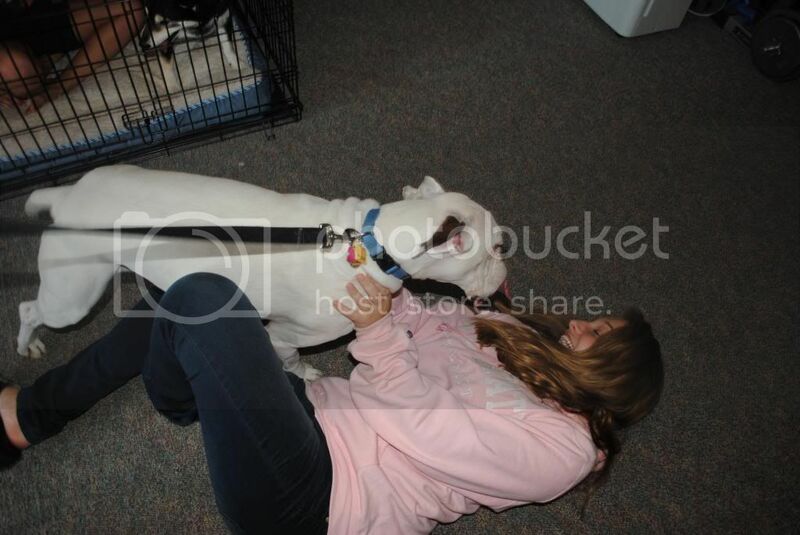 So you have fun with the pit bulls. I hope they have fun with you too! Everyone please keep the topic about BSL and not resort to petty arguing. This is about BSL, not just pitbulls are on BSL lists there are other breeds. 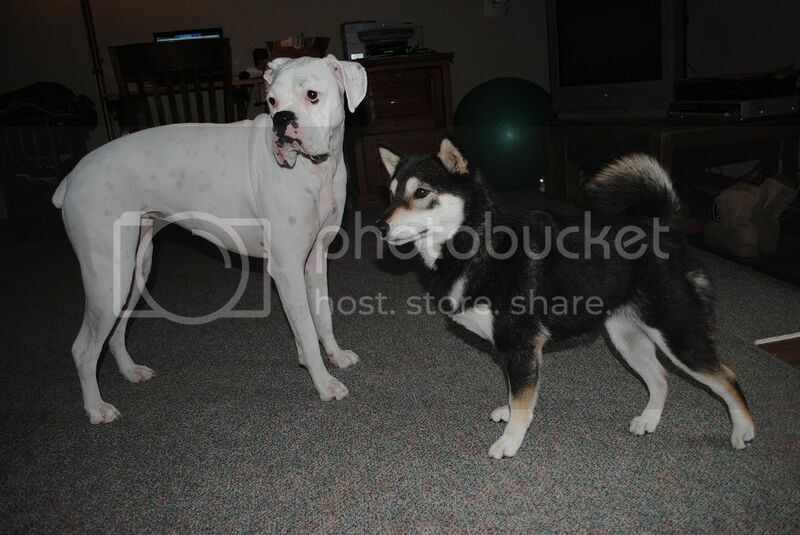 Boxers are sweet dogs yes some are rude and rough and excited, but some shiba can be rude and rough. They don't deserve the hate they get though..
@Kitsune1 please stop posting if you don't like it here so much. If you don't get that there are actually good well socialized pit bulls then you need stop painting all bully breeds with same brushstroke. please keep this on topic and no more name calling or acting like your right and your wrong type situation. Bella loves Saya and she defends her from dogs she thinks is being rude to her. Wasn't for Bella Amy the rat terrier would have bitten her she chased the mean dog off. Yes Inoushi may have been referring to you in comments, but it applies to any other person who is focused on bringing about BSL..
People won't listen to reason they yell they have locking jaws! They never let go! They get bloodthirsty if you feed them meat and so on so many lies and nonsense. Bad breeders are the issue for all breeds as they don't breed for temperament and don't care where their puppy ends up. every dog in this world has this issue not just pitbulls just they're in wrong hands and hands who are inexperienced and don't socialize the dogs. Here's another link to the documentary. DVD That's into the BSL Beyond the myth movie. it also is on netflix so another option. I plan to buy the dvd. Lindsay that second video is pretty amazing! It's always interesting to see dog working, even in a situation like that! Yes, Curlytails, you hit on an important point, and one of the reasons we even have a thread like this. 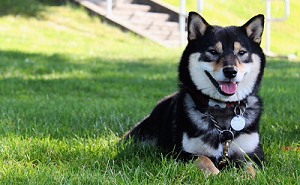 The point is, this is a place for people who love Shibas, but also love other dogs, and are interested in and knowledgeable about canines in general. People are not willing to let misconceptions about a breed stand--whether it is Shibas or bully breeds or any others. And BSL may start with one targeted dog, like "pit bulls" but it ends up effecting many more. As others have noted, most people haven't a clue what a "pit bull" is or looks like, and they target a huge swathe of wildly different dogs, from boxers to Amstaffs, to breeds that aren't even remotely "pit bulls." They also include other dogs people have perceived to be "dangerous" from the more common GSDs and Dobermans and Rottweilers, to Akitas to Chow Chows. And the BSL does NOT lower the incidence of dog bites and dog bite related fatalities, because any dog can bite! (In alaska, for example, it has long been "huskies" who are involved in serious dog bites, simply because there are more "huskies" (usually a mix) than any other breed). Anyway, the more (real) information we can get about the problems with BSL, the better. Links and information will be useful for those who really want to learn something about BSL (rather than just respond with kneejerk opinions, uninformed opinions). I don't agree with BSL on any level, but I am guilty of being a bit wary of pit bulls in general. It seems like the original comment on the intro thread that sparked the resurrection of this one was just someone stating an opinion that they are leery of pit bulls, especially those not under the control of a responsible owner. That doesn't seem especially inflammatory to me, although later comments on that thread, both by the original poster & others, did certainly seem on the offensive side. I have only had 3 experiences with pit bulls, and all 3 of them have been negative. That's not to say that all pit bulls are bad dogs, but I certainly turn the other direction when I see unleashed ones on the street, and I understand why others feel that way. My first up close experience with a pit bull was one that we offered to petsit while a friend was out of town. The dog was as sweet as she could be to humans, but tried to violently attack both my Shiba & my Pomeranian when they got near her crate. That, of course, made for a very tense week since she had to be separated from my two at all times. But I understood her stress at being away from her family, and I didn't blame her for being aggressive when she felt like her space was being invaded. My second & third experiences both came from stray pit bulls in our neighborhood. Initially two pit bulls were running loose. The bully advocates in our neighborhood asked for patience while they tried to capture the loose dogs. They were trying to lure them with food into crates so they could take them to a rescue group, and they begged us not to call animal control because of the likelihood of the dogs being put down. They kept citing how pit bulls unfairly have a bad name & how most of them are sweet, blah, blah, blah. The next day, a man walking with his leashed German shepherd & young son was attacked in front of his own house. The German shepherd defended his owner & came away with injuries resulting in a $2000 surgery. If that had been either of my dogs, they would have been dead. Animal control was called immediately & the two dogs were hauled away. Within a week another pit bull (a different one) was roaming the neighborhood. I was out walking Elwood & the dog approached us growling. Elwood wagged his tail & tried to play & the dog bared its teeth. I grabbed Elwood in my arms and slowly started walking away. The dog followed us for 2 blocks growling until I flagged down a car & the man driving was able to grab the dog. Several other people were followed by this same dog that day, with it growling and showing its teeth. Animal control was again called & the dog was finally picked up, after 3 days of them being unable to capture it because it kept going in & out of a hole in its fence (the owners refused to fix the hole & kept insisting that it wasn't a threat to anybody in the neighborhood). Once animal control finally picked up the dog, the owners must not have paid the fee to pick it up because I haven't seen the dog in our neighborhood again. Interestingly, I've seen many other loose dogs in our neighborhood, and never had a problem with any of them. We've had beagles, Australian shepherds, American eskimos, golden retrievers, boxers (among others) get out of their yards (we apparently have some very careless dog owners in our neighborhood!) and I haven't heard of one case of any of those dogs showing aggression. We have a neighborhood forum, so if there had been an issue, I would likely have heard of it. It's interesting to me that out of all the dogs that have been running loose in our neighborhood, the only three problematic ones have all been pit bulls. I haven't met a people aggressive pit bull, but the dog aggressiveness of the ones that I've had contact with is quite enough to deter me from the breed. I do realize that they can't all be that way, and that the owners are most of the problem. But I will continue to be wary every time I see a pit bull that isn't on a leash, and I will call animal control immediately if I ever see one loose in our neighborhood again. Sorry if I offend anyone but here goes nothing. month old 11 pound shiba play with a pitbull all day, but some of those dogs, mostly due to poor ownership can be dangerous for other dogs. Ps: I have personally owed a Basset Hound, GSD and cocker spaniel. Only the cocker showed dog aggressiveness and that was due to an early age trauma. "we apparently have some very careless dog owners in our neighborhood!" They roamed much more and coarse wanted to meet my three dogs. 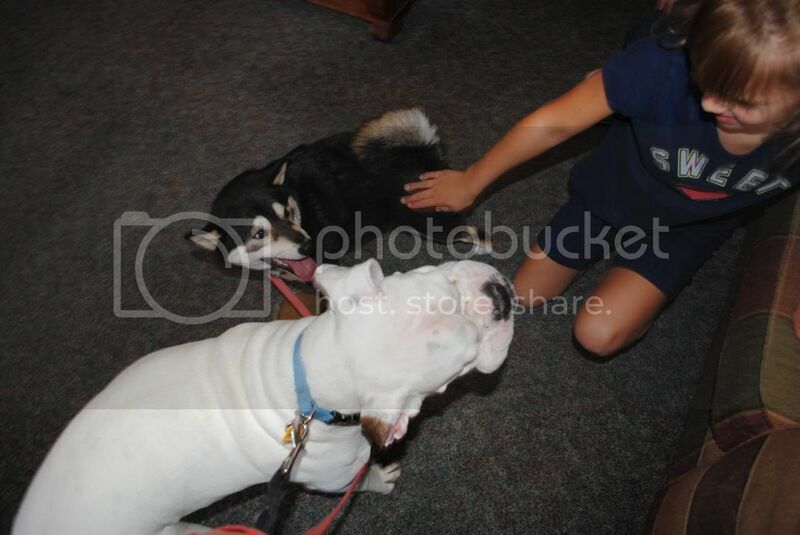 Two of which are dog reactive due to bad experiences with dogs down in Louisiana. Indiana is horrible with off leash dogs at least where I was. I can understand a very small town or country, but this is a busy city! I want walk my dog in peace without having to worry about protecting golden retrievers.. I'm like no! My dog's had too many bad experiences to trust strange dogs they react defensively out of fear. I had to go as far as saying I'll defend my dog if I need to! He has pissed off look and calls his dog.. Great your dog listens well, but it's rude to let him greet just any dog without asking. My three dogs are friendly to people, but will try hurt other dogs due to their bad experiences it's sad. Off leash is no place for in the neighborhoods with busy streets I don't care what breed the dog it..
"was just someone stating an opinion that they are leery of pit bull"
Thing is I have no issue with people stating their opinions, but there was no reason to post this on her intro post. Before she mentioned the attack no one has mentioned anything about pitbulls.. Unless it was edited? I dunno I wish we had option to edit, but now I wish we had zero option to edit posts.. If you don't mean what you post then don't post it at all. We need to get a long somehow. A lot of the messages were edited so some things were taken out of the message. I've had a lot of issues with huskies I don't want Siberian huskies to be banned.. It's not their fault only exercise they ever get is the dog park so once they get there they're overly hyper and rude. One husky resourced guarded 4 or 6 tennis balls and went for Saya for walking by. She paid no attention to the husky just walking about 7feet away from her to follow me. Luckily she was just warning Saya, but still that's a lot of tennis balls to hoard. I think if someone wants to state incidents they had fine, but to get so rude that's overboard to me. Of coarse your going to rile group of people when you say things like that. 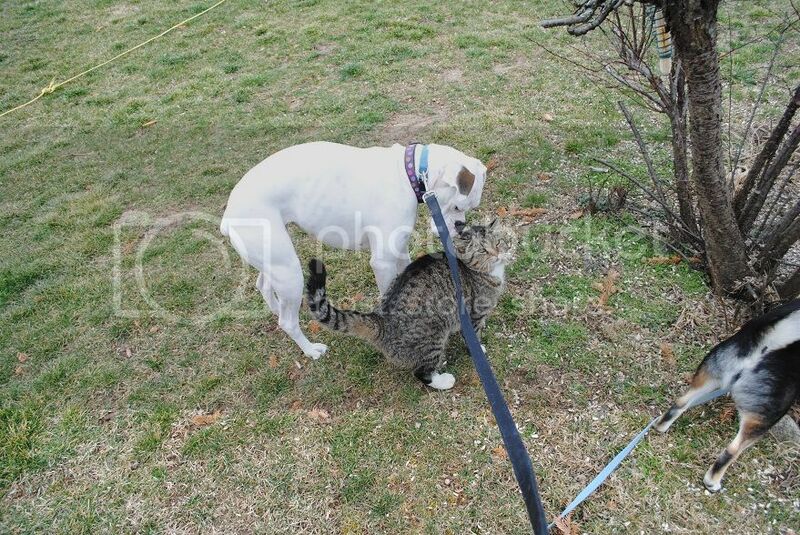 Sorry, but it doesn't take choke chains, E collars, or heavy equipment to handle pit bulls or any bully breed.. Bella walks just fine on normal nylon collar or front clip harness. Positive reinforcement works best for Bella.. Trust me our last two boxers pulled horribly non stop harness, normal collars, choke collars did nothing to stop them from pulling. My mom had enough of dad's methods and put them on harnesses and took the pulling. She and I was only one to walk them coarse dad was only around for fun stuff never walks or pick up their landmines..
BSL doesn't just affect pitbulls it affects dogs who people think are pitbulls Pretty much everyone except boxer owners seem to think Bella is a pitbull. The shock and horror on people's faces are unnecessary. I guess wouldn't be an issue since I live in country no need to go into public for walks I can take walks in the trails and in my neighbor hood lane my neighbor's know what breed she is. Yeah, I don't think anyone is saying people might not have individual differences in taste, or even be wary of dogs that they have had bad experiences with (I still don't like Boston Terriers, for example, because of the nasty ones that lived near me when I live in Michigan, even though I'm quite aware that probably most of them are nice dogs). What we're saying, though, is personal bad experiences with a breed do not equal an objective picture of the breed as a whole, and certainly that laws should not be based on the bad behavior of a few representatives of a breed. Anyway, some of the responses here are a bit confusing because they were referring to comments in another thread, and it was not just "I'm wary of these dogs" but was much more inflammatory than that. I really feel sorry for bully breed dogs in many ways since they are often judged so quickly. Some of THE nicest dogs my wife, Shiba, and I have encountered were bully breeds. The dog park we visit has some regulars that are bully breeds they are great with big and small dogs alike. Their owners have obviously spent a lot of time with training and socialization and it really shows. We were at the park over the weekend when a lady and her son show up with their "pit bull" and Boxer; they are some of the regulars and another lady next to me spots them, looks at her daughter and says: "uh oh, pit bulls, hurry and grab the dog (Aussie mix) before they get in..." I told her they were regulars, come at least once or twice a week, and are very well socialized, she tells me, "well they're pit bulls so it's just a matter of time so it's not worth the risk." To be quite honest, my wife and I have talked about getting a "pit bull" type of dog but probably won't because of the way people are so quick to judge. Oh, that and BSL that may prevent us from moving somewhere if we ever decide to.